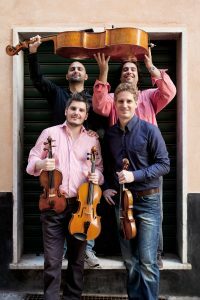 WHEN: Saturday, March 31, 2018, 8 p.m.
Saturday, March 31, 2018, 8 p.m. – The sleek-sounding Quartetto di Cremona returns to the VCC stage – program TBA. Sunday, May 6, 2018, 3 p.m. – Among the finest quartets of their generation, the Attacca Quartet will play Mendelssohn, Caroline Shaw and Beethoven’s sublime Op. 132.